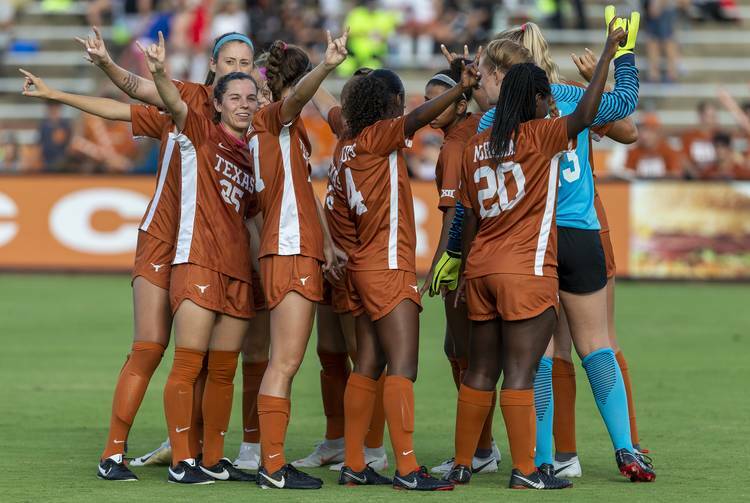 Alexa Adams scored with just one minute left to play in regulation as the Texas soccer team defeated Oklahoma, 3-2, in Norman on Friday night. Cyera Hintzen’s shot was saved before Adams cleaned up the rebound to put Texas ahead. The win moves the Longhorns to 11-2-2 and 3-2-1 in the Big 12. Texas had played four straight Big 12 road matches, going 1-2-1 in those contests. The winning goal was Adams’ second of the night. She scored in the 63rd minute to give Texas its first lead. Texas proved to be the more aggressive team on the night, taking 21 shots and putting 10 of them on goal. The Sooners took just eight with two on frame. Kaylee Dao gave the Sooners a 1-0 lead on a header in the 16th minute, assisted by Marissa McMahand. Katie Glenn tied the game with help from Haley Berg and Chelsea Surpris in the 27th minute. After Texas made it 2-1, a header by Paige Welch tied the game again in the 84th minute. Not six minutes later, Adams scored the goal that would hold off the Sooners. The Longhorns have a full week before their next contest when they host Kansas at Myers Stadium Friday at 7 p.m.